Sold by Cloudtail India (4.5 out of 5 | 73,021 ratings) and Fulfilled by Amazon. Gift-wrap available. 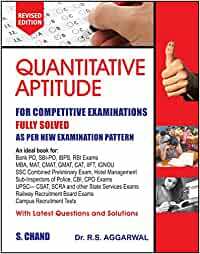 Ever since its release in 1989, Quantitative Aptitude has come to acquire a special place of respect and acceptance among students and aspirants appearing for a wide gamut of competitive exams. 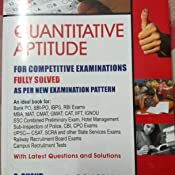 Now, more than a quarter of a century later, with the ever changing environment of examinations, the book too reinvents itself while being resolute to its core concept of providing the best content with easily understandable solutions. • Comprehensive: The book is more comprehensive than ever before with more than 5500 questions (supported with answers and solutions—a hallmark of Quantitative Aptitude). • Easy to follow: Chapters begin with easy-to-grasp theory complemented by formulas and solved examples. They are followed by a wide-ranging number of questions for practice. 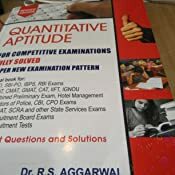 • Latest & Updated: With questions (memory based) from examinations up till year 2016, the book captures the latest examination patterns as well as questions for practice. Dr. R.S. Aggarwal was born on January 2, 1946 in a village of Delhi. 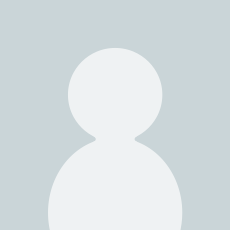 He graduated from Kirori Mal College, University of Delhi. After completing his M.Sc. in Mathematics in 1969, he joined N.A.S. College, Meerut as a lecturer. In 1976, he was awarded a fellowship for 3 years and joined University of Delhi for his Ph. D. Thereafter he was promoted as a reader in N.A.S. College, Meerut. In 1999, he joined M.M.H. College, Ghaziabad, as a reader and took voluntary retirement in 2003. He has written more than 75 books ranging from Nursery to M. Sc. and in the competitions segment from clerical grade to I.A.S. level. Really good book for Campus Placement aptitude tests. It helped to clear Capgemini, L&T Infotech aptitude tests. Note: Do not directly start solving, first try to understand topic from any YouTube channel and then begin solving from this book. 3) a wide variety of questions. 4) one month testbook pass free. Cons:- 1) found some printing mistakes ( a very few though). That's all. 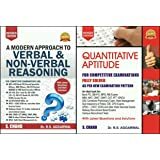 The book consists of a large number of multiple choice questions (MCQs) enlisted under 39 chapters divided into broader categories of Arithmetical Ability and Data Interpretation. Previous year questions have also been included in all of the chapters. 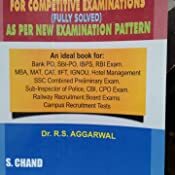 This book is ideal for Bank PO, SBI-PO, IBPS, RBI exam, MBA, MAT, CAT, IIFT, IGNOU, Hotel Management, SSC Combined Preliminary Exam, Sub-Inspector of Police, CBI, CPO Exam, Railway Recruitment Board Exams, Campus Recruitment Tests. Apart from the systematic division of the entire syllabus into various chapters, the quality of the book has been enhanced by putting in extra efforts to help the learner excel in the exam. First and foremost each chapter is provided with detailed information one would require in order to solve the questions in relation to the same. Followed by this there are a set of solved examples which gives the student a basic idea of what sort of questions he/she is going to encounter in the given chapter and the process to solve them. 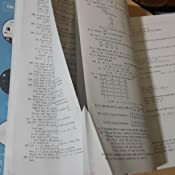 Last but not the least the solutions to each and every problem is provided in the book with the detailed solving method. The book is a quality product from the famous publishing house S. Chand Publishing and written by the acclaimed mathematician Dr. R. S. Aggarwal. These points leave no doubt regarding the usefulness of the book. This book is available in most of the book stalls that trade in educational books. The same is also available in online stores like Flipkart. The buyer is suggested to check the availability as per their convenience before proceeding to buy the book. There is no logo in the front and page quality is very poor it is a pirated version from Amazon. Totally unhappy there is no quality of the page and products looks like they have Xerox it and send it to me. A wonderful book, covers almost every chapter needed for competitive exams. I am a beginner. Started learning Maths with this book. Hope I'll be able to get over maths phobia. I got this for ₹363.